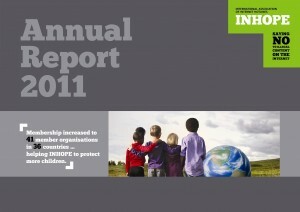 INHOPE published the report the year 2011, which gives an overview of the work of Hotlines, brings out achievements in the work of Hotlines in different countries and presents statistics. INHOPE (www.inhope.org) is an international network, which was created in 1999 and by today connects 41 Hotlines in 36 countries all around the world. Estonian (www.vihjeliin.ee) was created in February 2011 and joined INHOPE network in November 2011. The network improves and supports the cooperation between different countries’ Hotlines in the battle against blocking the spreading of online materials containing sexual abuse of children. The role of the Hotlines is to give the public a chance to inform anonymously of illegal materials spreading on the Internet, with the aim to remove these materials from the web. In order to remove the materials, Hotlines have tight cooperation with police and Internet service providers as well as other Hotlines around the world. In 2011, Hotlines in the INHOPE network processed altogether 29 908 messages which contained images portraying sexual abuse of children. This is 24% more than last year. Last year, 82% of illegal materials were removed from in 7 days after receiving the information, and 58% of them was removed in 48 hours.